Hi! 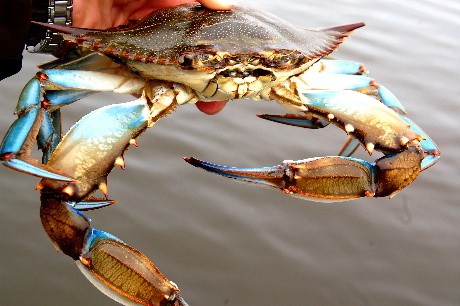 My name is Beaux, (bo), and I am a blue crab. I would like to tell you the story of my life—where I came from and where I’m headed. Would that be okay with you? The estuary waters of south Louisiana are my home, and what a wonderful home it is. My life as a crustacean (crus ta shun), though short, has been an interesting one so far. I have gone through many stages and have had many different names. First, I was just an egg. My mother carried me around on her tummy until she reached the place in the estuary where the water was just the right saltiness to release my two million siblings and me. Then I became a larva, floating around in the salty water, eating tiny things floating around me called plankton. Then I grew by doing a trick called molting, which means I got a new body about four times in about 40 days. Pretty cool, huh? By the time I was about six weeks old, I started eating detritus and small fish. Within a few more weeks, I looked just like a tiny crab. I had a hard shell, six legs, and two big claws, which were great for grabbing my food and putting it in my mouth. Once I had my swimmers, life really started to get fun! I could quickly scoot sideways along the bottom of the estuary in a cloud of muddy water where no one could find me. That came in really handy when we played crab tag! It took me about a year and a half to grow up and carry millions of eggs on my tummy for the first time. And wow! What great fun that was, releasing my eggs and watching them float off into the estuary to make millions of tiny new crabs. I have had a wonderful life in the south Louisiana Estuary system. If you ever come to visit, leave your crab tongs at home, please! Passing on a article I just read,we have been dicussing why they as scientists released unconfirmed research and then spread it like gossip. I agree that unconfirmed research should have never been released, BUT we must keep in mind that the media are vulturistic and they grab any little tidbit they can and run with it, whether it’s been confirmed or not. Looks like we can thank the AP for spreading this rumor. The media thrives on bad news because it sells. You know as well as I that they will focus on the worst case scenario every time. So, thanks for sharing this so now Steffi can go get her fill of boiled crab and not worry about glowing in the dark tonight (or whatever it is Corexit of petroleum might make her do)! Amazon doesn’t list your books, at least not by title. E-mail me (please) with infor on how/where I can buy them. I have young granddaughter who would like them. Hi Sue. Amazon has Before the Saltwater Came, new and used. If you prefer to have a book personalized, you may order directly from Wetland Books website using Pay Pal. Just make sure you write a note in special instructions if you want it signed. The Creature series is not yet available. Y’all are getting a preview! I knew your next character (estuary creature), would be a crab! The name didn’t give a hint though.I think I’ll go buy some of Beaux’s cousins (already boiled ) tomorrow. Beaux’s cousins were safe today. Maybe tomorrow. We were on “grandparent duty” today and I didn’t get out to make my tasty purchase. Who do you buy crab from? They either come from Christian Bros. in Gonzales (Lake Pontchatrain crabs) or Tony’s Seafood in B.R. (as in La. Seafood Products). I think Choup frequents those places, also. Your story is wonderful, educational and entertaining so that children (and adults) learn without realizing it. Love them. That was my intention, Cammy! I would love to have a set of your books also BW – even though I’m not teaching anymore. You’ll get the first published copy, much like the first book!!! I’ll have to see about ordering this one when it is published to go with the one my grandson won. He enjoyed it tremendously and I think he will like this one just as much. Thanks, Moura! Be sure and look at Amazon.com for an autographed “used” copy. They are cheaper than new, which is $19.95. Also, there are only about 60 of these left in print, which will become “limited editions” here pretty quick. I’m thinking about going to Amazon.com and buying all those used ones for myself!!! LOL!